Sagrada Família, the Barcelona church still undergoing construction according to the ambitious vision of Catalan architect Antonio Gaudí, is by far the top sight in Barcelona. The exterior is unique and interesting, but is no match for the interior. Don’t be intimidated by the long lines (which move quick) or the €13 admission. The time and money investment to see one of the most dramatic examples of modern architecture is a very worthwhile investment. Believe it or not, we were somewhat underwhelmed with the exterior of the building. The Nativity Facade, which was the only section of the church completed while Gaudí was alive, is very cluttered and starting to show it’s age. The newly completed Passion Facade seems much cleaner, and completed in what appears to be a much more modern style (which appealed to us). The size of the building was not as impressive as we had expected, but I have no doubt that after completion, when capped by the 558-foot Jesus Christ tower, the size of the building will be spectacular. Right now, the tallest tower is 394 feet. After walking through the door at the Passion Facade we knew we were entering somewhere special. Gaudí used nature to inspire his architecture, which is clear in Sagrada Família. The columns used to support the building show a strong resemblance to tree trunks. They are not straight pillars, as you would see in a more traditional church, but curvy. Looking straight-up at the 148-ft high ceiling (about the same height at St. Peter’s in Rome), there are gorgeous patterns, as depicted in the picture of the nave above. We actually decided to forego the rental of an audio guide (another €4), because we sometimes believe they distract from the experience. Instead, we used a self-guided tour included in Rick Steves‘ Spain guidebook. Written tours allow you to set your own pace, and not worry about listening and experiencing the space at the same time. We learned just enough to appreciate the history and significance of the place, but not too much to distract us from developing our own impressions and memories. Looking along the nave in Sagrada Família. Notice the perched choir and that only some of the windows have stained glass installed. In addition to the nature-inspried columns and ornate ceilings, we were also impressed with the choir, which is suspended on a balcony high up in the air, and adorned with a modern glass handrail and can support 1,500 singers. The stained glass windows were also very impressive. Interestingly, many of the windows still have clear glass (see picture above) that will later be replaced. Resultantly, the interior is much brighter than it will ultimately be when the church is completed. After admiring the interior and the two completed facades, we wondered down to the crypt, where a museum on the church’s construction is housed. We learned a fair amount through our self-guided tour, so we decided to walk briskly through the exhibits. There were several models of what the church would ultimately look like, which were interesting. 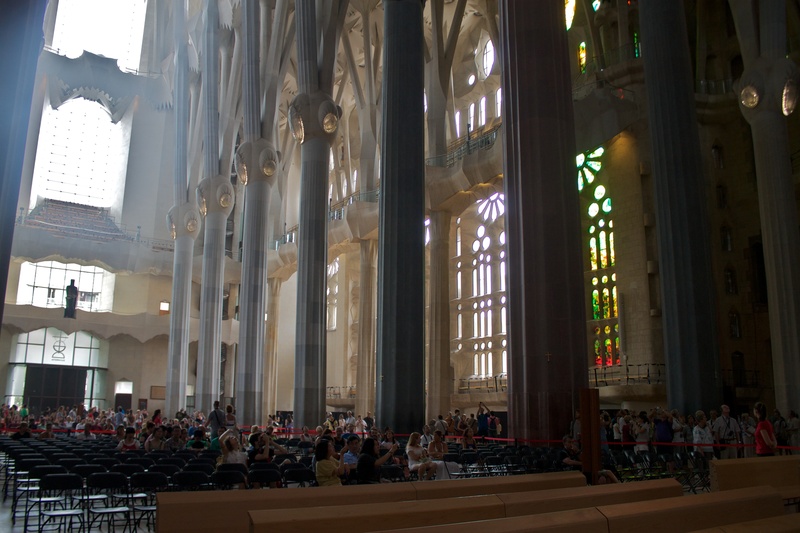 Sagrada Família was a definitive highlight on our trip to Barcelona. 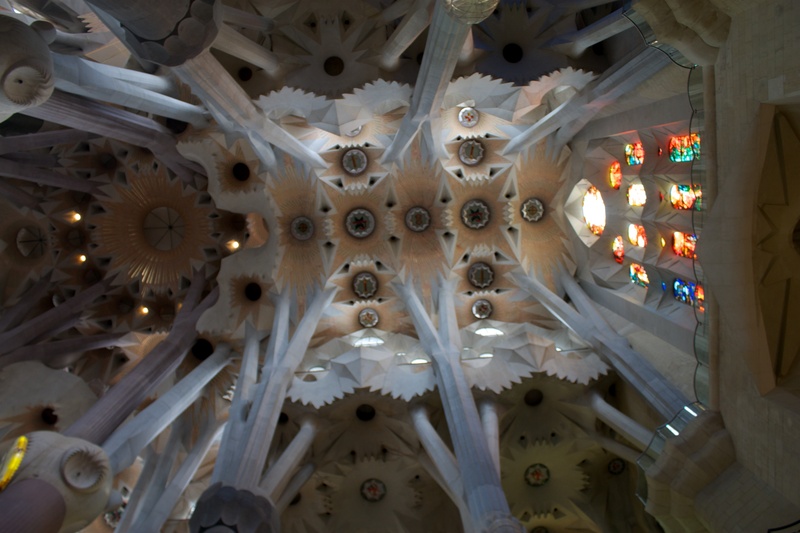 Visiting the interior is well worth the ticket price, especially considering the value in comparison to more expensive Gaudí sights in Barcelona (Casa Milà at €16.50, Casa Batlló at €20.30). We look forward to returning when the church is complete (tentatively 2026-2028)! This entry was posted in Travel and tagged Barcelona, Europe, Portugal/Spain 2012 Trip by Ryan. Bookmark the permalink.